Product prices and availability are accurate as of 2019-04-23 18:04:12 UTC and are subject to change. Any price and availability information displayed on http://www.amazon.com/ at the time of purchase will apply to the purchase of this product. WEXIER focus on urban business casual leather goods, products advocating fashion style and absorbing the popular elements of the season, popular but not identical. It brings a stylish attitude and quality of life to his customers. 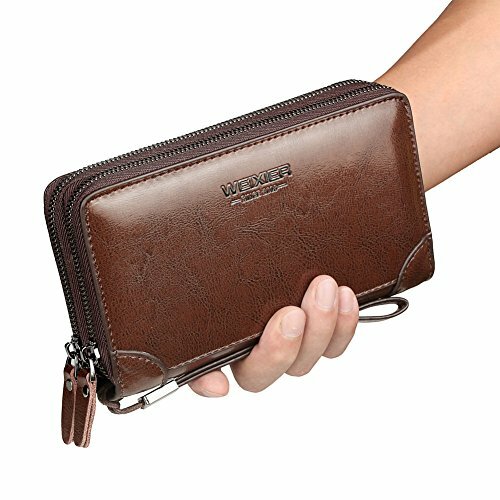 The daily companion: Vintage business leather hand clutch wallet offer a variety of functions to carry everything you need for your daily transaction. 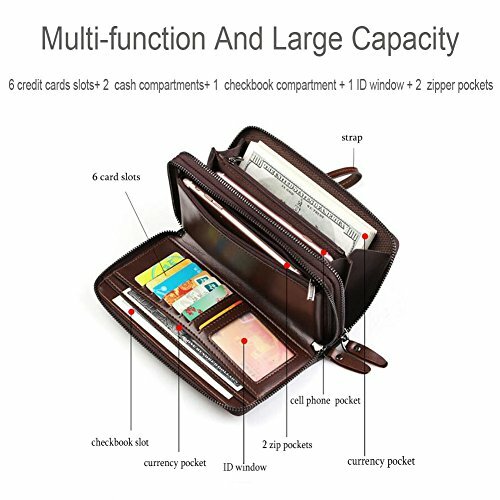 Large Capacity with well-designed interior structure, makes the zipper wallet phone holder checkbook wallet more classical, business and elegant stylish. Dimensions: L7.87" x W4.72" x H1.96"(20cm x 12cmx 5cm). Material: Top quality genuine cowhide leather(Soft and Smooth). Very well made wristlet clutch handbag is made by professional artisans with finest craftsmanship. Delicate design and neatly stitched to ensure travel wallet longevity, Superb uniform sutures, even in the corner of the junction is still smooth and beautiful, fine workmanship and well made. 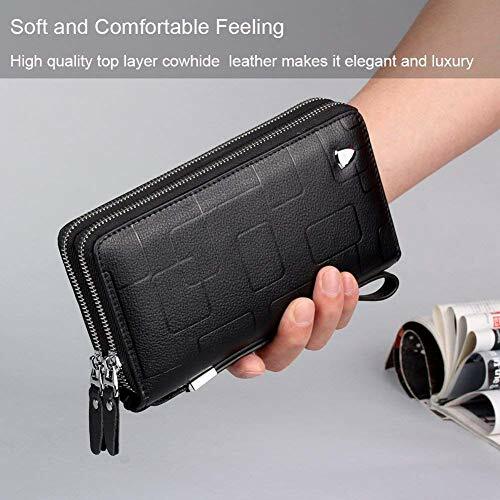 Genuine Leather: The leather black clutch bag was made of a whole piece of second layer cowhide, Make sure the handbag durable, comfortable and luxury. One for years! 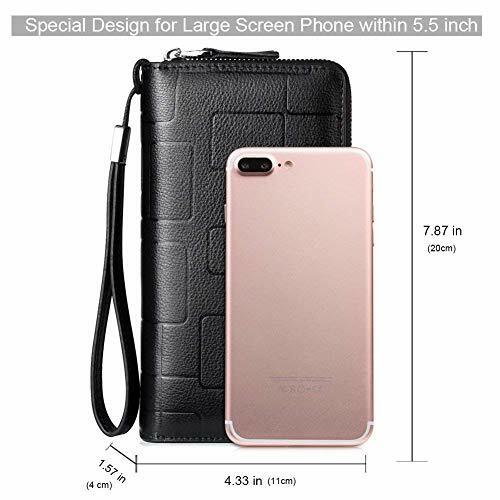 Huge Capacity and Functional Structure: L7.87" x W4.72" x H1.96", Easily to carry all your daily stuffs, like smart phone, iPhone 8/8Plus 7/7Plus/6S, 2 zipper pockets, 6 card slots, 2 cash slots, 1 checkbook slot, 1 ID window, etc. One is all! 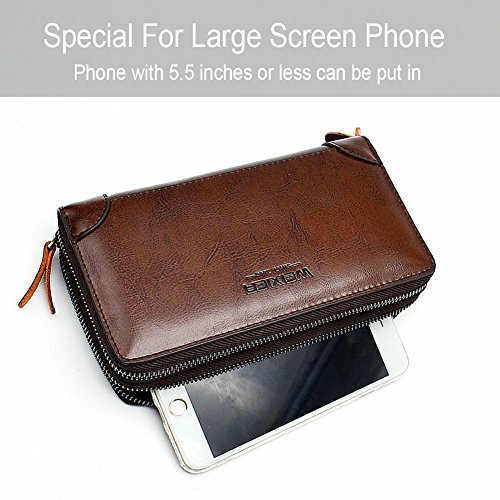 Special Design for Large Screen Phone: Phone with 5.5 inch or less can be put in. The clutch wallet phone holder has a detachable wrist strap will make your belongings safer. 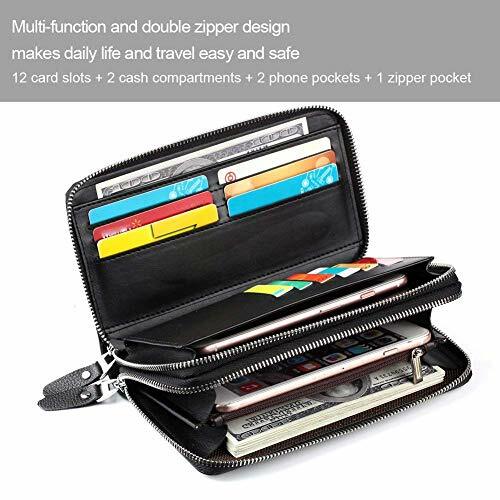 Fashion & Business: The double zipper trifold long wallet card case suit perfect for all occasion, business, casual, daily. Just take it, always delighting you. Whatever the fashion style change, our quality and the workmanship will keep the best all the time. One with you! Gift Packing: The leather hand wallet is a perfect gift for your friends, family and colleagues. Also for Groomsmen, Birthdays, Christmas, Anniversaries, Father's Day, Valentines Day, and other Special Occasion.